The Mystical Supper, Icon by Simon Ushakov (1685). Maundy Thursday (also known as Holy Thursday, Covenant Thursday, Great and Holy Thursday, Sheer Thursday, and Thursday of Mysteries) is the Christian holy day falling on the Thursday before Easter. It commemorates the Maundy and Last Supper of Jesus Christ with the Apostles as described in the Canonical gospels. It is the fifth day of Holy Week, and is preceded by Holy Wednesday and followed by Good Friday. The date is always between 19 March and 22 April inclusive, but these dates fall on different days depending on whether the Gregorian or Julian calendar is used liturgically. Eastern churches generally use the Julian calendar, and so celebrate this feast throughout the 21st century between 1 April and 5 May in the more commonly used Gregorian calendar. The liturgy held on the evening of Maundy Thursday initiates the Easter Triduum, the period which commemorates the passion, death, and resurrection of Christ; this period includes Good Friday, Holy Saturday, and ends on the evening of Easter. The Mass or service of worship is normally celebrated in the evening, when Friday begins according to Jewish tradition, as, according to the three Synoptic Gospels, the Last Supper was held on the feast of Passover; according to the Gospel of John, however, Jesus had his last supper on Nisan 14, the night before the first night of Passover. 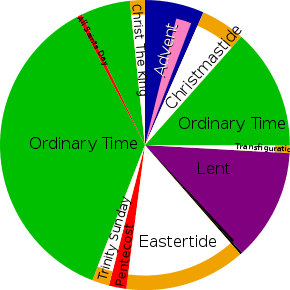 Use of the names "Maundy Thursday", "Holy Thursday", and the others is not evenly distributed. What is considered the normal name for the day varies according to geographical area and religious allegiance. Thus, although in England "Maundy Thursday" is the normal term, the term is rarely used in Ireland, Scotland or Canada. People may use one term in a religious context and another in the context of the civil calendar of the country in which they live. The day is sometimes confusingly called Easter Thursday, which more correctly refers to the following Thursday after Easter. The Book of Common Prayer of the Church of England, which is the mother Church of the Anglican Communion, uses the name "Maundy Thursday" for this observance. The corresponding publication of the Protestant Episcopal Church in the United States of America, which is another province of the Anglican Communion, also refers to the Thursday before Easter as "Maundy Thursday". Throughout the Anglican Communion, the term "Holy Thursday" is a synonym for Ascension Day. In the present day, within the Roman Rite of the Catholic Church, the name "Holy Thursday" is used in its official English-language liturgical books. The personal ordinariates in the Catholic Church, which have an Anglican patrimony, retain the traditional English term "Maundy Thursday", however. An article in the 1911 Catholic Encyclopedia used the term "Maundy Thursday", and some Catholic writers use the same term either primarily, or alternatively. The United Methodist Church uses the name "Holy Thursday" in its Book of Worship, but in other official sources it uses both "Maundy Thursday" and "Holy Thursday". In the Eastern Orthodox Church, the name for the holy day is, in the Byzantine Rite, "Great and Holy Thursday" or "Holy Thursday", and in Western Rite Orthodoxy "Maundy Thursday", "Holy Thursday" or both. The Coptic Orthodox Church uses both the terms "Maundy Thursday" and "Covenant Thursday" for the holy day. "Maundy Thursday" is the official name in the civil legislation of England and the Philippines. The day has also been known in English as Shere Thursday (also spelled Sheer Thursday), from the word shere (meaning "clean" or "bright"). This name might refer to the act of cleaning, or to the fact that churches would switch liturgical colors from the dark tones of Lent, or because it was customary to shear the beard on that day, or for a combination of reasons. This name is a cognate to the word still used throughout Scandinavia, such as Swedish "Skärtorsdag", Danish "Skærtorsdag", Norwegian "Skjærtorsdag", Faroese "Skírhósdagur" and "Skírisdagur" and Icelandic "Skírdagur". Skär in Swedish is also an archaic word for wash. Most scholars agree that the English word Maundy in that name for the day is derived through Middle English and Old French mandé, from the Latin mandatum (also the origin of the English word "mandate"), the first word of the phrase "Mandatum novum do vobis ut diligatis invicem sicut dilexi vos" ("A new commandment I give unto you, That ye love one another; as I have loved you"), the statement by Jesus in the Gospel of John 13:34 by which Jesus explained to the Apostles the significance of his action of washing their feet. The phrase is used as the antiphon sung in the Roman Rite during the "Mandatum" ceremony of the washing of the feet, which may be held during Mass or at another time as a separate event, during which a priest or bishop (representing Christ) ceremonially washes the feet of others, typically 12 persons chosen as a cross-section of the community. In 2016 it was announced that the Roman Missal had been revised to permit women to have their feet washed on Maundy Thursday; previously it permitted only males to do so. Others theorize that the English name "Maundy Thursday" arose from "maundsor baskets" or "maundy purses" of alms which the king of England distributed to certain poor at Whitehall before attending Mass on that day. Thus, "maund" is connected to the Latin mendicare, and French mendier, to beg. A source from the Lutheran Church–Missouri Synod likewise states that, if the name was derived from the Latin mandatum, we would call the day Mandy Thursday, or Mandate Thursday, or even Mandatum Thursday; and that the term "Maundy" comes in fact from the Latin mendicare, Old French mendier, and English maund, which as a verb means to beg and as a noun refers to a small basket held out by maunders as they maunded. Holy Thursday is notable for being the day on which the Chrism Mass is celebrated in each diocese. Usually held in the diocese's cathedral, in this Mass the holy oils are blessed by the bishop, consisting of the chrism, oil of the sick, and oil of catechumens. The oil of the catechumens and chrism are to be used on the coming Holy Saturday at the Easter Vigil, for the baptism and confirmation of those entering the church. The Washing of the Feet is a traditional component of the celebration among many Christian groups, including the Armenian, Ethiopian, Eastern Catholic, Schwarzenau (German Baptist) Brethren, Church of the Brethren, Mennonite, and Roman Catholic traditions. The practice is also becoming increasingly popular as a part of the Maundy Thursday liturgy in the Anglican/Episcopal, Lutheran, Methodist, and Presbyterian churches, as well as in other Protestant denominations. In the Catholic Church and in some Anglican churches, the Mass of the Lord's Supper begins as usual, but the Gloria is accompanied by the ringing of bells, which are then silent until the Easter Vigil. After the homily the washing of feet may be performed. The Blessed Sacrament remains exposed, at least in the Catholic Mass, until the service concludes with a procession taking it to the place of reposition. The altar is later stripped bare, as are all other altars in the church except the Altar of Repose. In pre-1970 editions, the Roman Missal envisages this being done ceremonially, to the accompaniment of Psalm 21/22, a practice which continues in many Anglican churches. In other Christian denominations, such as the Lutheran Church or Methodist Church, the stripping of the altar and other items on the chancel also occurs, as a preparation for the somber Good Friday service. Orthodox icon of Christ washing the feet of the Apostles (16th century, Pskov school of iconography). Reading of the 12th Passion Gospel on Great and Holy Thursday. Bishop Sebouh Chouldjian (Armenian Apostolic Church) washing the feet of children during the Washing of Feet ceremony. In Kerala State in India, the day is called as Pesaha(പെസഹ), a Malayalam word derived from the Aramaic or Hebrew word for Passover. It is a statewide public holiday declared by the Government of Kerala, given the high number of Saint Thomas Christians or Nasranis in the state. The tradition of consuming Pesaha appam or Indariyappam is customary after special longer Holy Qurbana, which are conducted on the or at midnight till morning in Syrian Christian churches. On the evening before Good Friday the Pesaha bread is made at home. It is made with unleavened flour and they use a sweet drink made up of coconut milk and jaggery along with this bread ( can be compared to Charoset). On the Pesaha night the bread is baked or steamed in a new vessel, immediately after rice flour is mixed with water and they pierce it many times with handle of the spoon to let out the steam so that the bread will not rise ( this custom is called " juthante kannu kuthal" in the Malayalam language meaning piercing the bread according to the custom of Jews). This bread is cut by the head of the family and shared among the family members after prayers. In some families, a creamy dip made up of jaggery and coconut milk is used along with the Peasha bread. If the family is in mourning following a death, Pesaha bread is not made at their home, but some of the Syrian Christian neighbours share their bread with them. This custom may have its origin in their probable Jewish ancestry since many other Jewish customs like separating the sexes at church, praying with veil in their heads(women), naming conventions in line with the Jewish customs, kiss of peace( kaikasthoori) in their Holy Quorbono (mass), presentation of their babies on the 40th day after birth in the church and ceremonial bath of the dead bodies. Unlike other Christians, in their weddings the bride stands on the right side of the groom resembling the Jewish custom and during the wedding a veil is given to the bride. The Saint Thomas Christians diaspora also celebrate this day by having Holy Communion services in the parishes according to their respective liturgies. The tradition of washing feet by priests is practised in every parish commemorating Jesus washing the feet of his disciples symbolizing humbleness. In the Philippines, the day is officially known as Huwebes Santo or "Maundy Thursday" (the term "Holy Thursday" is rarely used). Most businesses are closed during the Easter Triduum, with shopping malls opening on Black Saturday. Terrestrial television and radio stations either go completely off-air during the Triduum or operate on shorter hours with special programming; cable channels usually retain their normal programming. Newspapers do not publish on Maundy Thursday and Good Friday. Christus, by the Lutheran Lucas Cranach the Elder. This woodcut of John 13:14-17 is from Passionary of the Christ and Antichrist. Maundy Thursday is a public holiday in Colombia, Costa Rica, Denmark, Iceland, Mexico, Norway, Paraguay, the Philippines, Spain, and Venezuela, and in Kerala State of India. Certain German states declare a public holiday for public sector employees. In the UK, civil servants were traditionally granted a half-day holiday (known as "privilege leave") on this date, but that was abolished after 2012. In the Philippines the tradition is called Visita Iglesia (Spanish, "church visit"), where people visit one, seven, or fourteen churches to pray, usually reciting the Stations of the Cross. Today, the Stations are often divided amongst the churches; until the 1970s all fourteen were recited in each church. It is a chiefly urban custom as churches are located closer to each other in cities, and supposedly because the ritual has roots in the Spanish Era, when the seven churches of Intramuros were still standing. The original intent of the custom was to visit the Blessed Sacrament in the Altar of Repose on Maundy Thursday evening, but since no specific prayers apart from those for the Pope were prescribed, the Stations of the Cross were used instead. Some Filipino liturgists, however, have sought to revive the original vigil with the Blessed Sacrament, and have composed prayers to guide worshippers. 1 2 Gail Ramshaw (2004). Three Day Feast: Maundy Thursday, Good Friday, and Easter. Augsburg Books. Retrieved 2009-04-11. In the liturgies of the Three Days, the service for Maundy Thursday includes both, telling the story of Jesus' last supper and enacting the footwashing. ↑ Leonard Stuart (1909). New century reference library of the world's most important knowledge: complete, thorough, practical, Volume 3. Syndicate Pub. Co. Retrieved 2009-04-11. Holy Week, or Passion Week, the week which immediately precedes Easter, and is devoted especially to commemorate the passion of our Lord. The Days more especially solemnized during it are Spy Wednesday, Maundy Thursday, Good Friday, and Holy Saturday. ↑ Peter C. Bower. The Companion to the Book of Common Worship. Geneva Press. Retrieved 2009-04-11. All of Holy Week points toward the passion-the death and resurrection of Christ. The week's three final days (from sunset Thursday through sunset on Easter) complete the commemoration of Christ's passion. These three days are called the Triduum. ↑ Gwyneth Windsor, John Hughes (Nov 21, 1990). Worship and Festivals. Heinemann. Retrieved 2009-04-11. 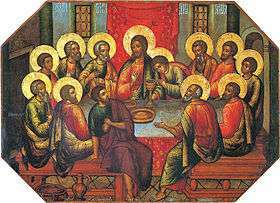 On the Thursday, which is known as Maundy Thursday, Christians remember the Last Supper which Jesus had with his disciples. It was the Jewish Feast of the Passover, and the meal which they had together was the traditional Seder meal, eaten that evening by the Jews everywhere. 1 2 "A Table of the Vigils, Fasts and Days of Abstinence to be observed in the year" (PDF). Church of England. Retrieved 21 March 2016. ↑ "The Calendar of the Church Year", p. 17. ↑ Thomas Ignatius M. Forster (1828). Circle of the Seasons, and Perpetual key to the Calendar and Almanack. Oxford University Press. Retrieved 1 April 2012. Holy Thursday or Ascension Day. Festum Ascensionis. Le Jeudi Saint d' Ascension. ↑ George Soane (1847). New Curiosities of Literature and Book of the Months. Churton. Retrieved 1 April 2012. Ascension Day, or Holy Thursday. This, as the name sufficiently implies, is the anniversary of Christ's Ascension. ↑ "General Instruction of the Roman Missal, with adaptations for England and Wales" (PDF). Catholic Bishops' Conference of England & Wales. Retrieved 2009-04-11. ↑ "Holy Week and Easter with the Ordinariate in London" (PDF). Personal Ordinariate of Our Lady of Walsingham. 2014. Retrieved 21 March 2016. ↑ "Maundy Thursday (Holy Thursday)". Catholic Encyclopedia. New Advent. 2009. Retrieved 5 April 2014. ↑ Authors, Various (2008). Mariology: A Guide for Priests, Deacons, Seminarians, and Consecrated Persons. Mark I. Miravalle, S.T.D. p. 659. ISBN 9781579183554. Retrieved 5 April 2014. The season of Lent prepares the Church for the celebration of the Paschal Mystery during the sacred Triduum of Maundy Thursday, Good Friday, and Holy Saturday. ↑ Akin, Jimmy (27 March 2013). "10 things you need to know about Holy Thursday". National Catholic Register. Retrieved 5 April 2014. Holy Thursday is thus sometimes called Maundy Thursday because it was on this day that Christ gave us the new commandment--the new mandate--to love one another as he loves us. ↑ "United Methodist Book of Worship: Scripture Readings listed according to the Books of the Bible". General Board of Discipleship, The United Methodist Church. Retrieved 2009-04-11. ↑ "Holy Week Service for Midweek, Maundy Thursday, or Good Friday". United Methodist Church. Retrieved 2009-04-05. ↑ "Maundy Thursday". United Methodist Church. Retrieved 2009-04-05. ↑ "Preaching Helps for Holy Thursday, Year B (April 17, 2003)". United Methodist Church. Retrieved 2009-04-13. ↑ "Worship Planning Helps for Holy Thursday (April 8, 2004)". United Methodist Church. Retrieved 2009-04-13. ↑ "What is Holy Thursday?" (PDF). University Lutheran Chapel, Lutheran Church–Missouri Synod. Retrieved 2009-04-11. ↑ "Maundy Thursday". Historic Trinity Lutheran Church, Detroit. Retrieved 2009-04-11. ↑ "Counting. A little history of how '40 Days of Lent' came to be". The Lutheran, the magazine of the Evangelical Lutheran Church in America. Retrieved 2009-04-11. ↑ "Maundy Thursday". Reformed Church in America (RCA). Retrieved 2009-04-11. ↑ "Calendar 2009 Year of the Reformer John Calvin". The Hungarian Reformed Church in the US and Diaspora. Retrieved 2009-04-11. 1 2 "Calendar". Suydam Street Reformed Church. Retrieved 2009-04-11. ↑ The Presbyterian Handbook. Geneva Press. 2006. p. 75. Retrieved 1 April 2012. These days (approximately three 24-hour periods) begin on Maundy Thursday evening and conclude on Easter evening. On Maundy Thursday we hear the story of Jesus' last meal with his disciples and his act of service and love in washing their feet. ↑ "Great and Holy Thursday". Greek Orthodox Archdiocese of America. Retrieved 2009-04-05. ↑ "Great Lent: Theology, Homilies, Services, Resources". St Nicholas Russian Orthodox Church, McKinney (Dallas area) Texas. Retrieved 2009-04-12. ↑ "The Historical Development of Holy Week Services In the Orthodox/Byzantine Rite". Antiochan Orthodox Christian Archdiocese of North America. Retrieved 2009-04-12. ↑ "Saint Mark's Church: An Antiochian Orthodox Parish in the Western Rite Tradition" (PDF). Western Orthodox. Retrieved 2009-04-11. ↑ "Oratory of Our Lady of Glastonbury: Western Rite Orthodox Outreach to Southern Ontario" (PDF). Oratory of Our Lady of Glastonbury. Retrieved 2009-04-11. ↑ "Orthodox Liturgical Index". The Society of Clerks Secular of Saint Basil. Retrieved 2009-04-12. ↑ "Lent" (PDF). Holy Incarnation Orthodox Church. Retrieved 2009-04-12. ↑ "G Maundy (Covenant) Thursday". Coptic Orthodox Church. Retrieved 2009-04-12. ↑ Liturgical Notes: Thursday of Mysteries Archived March 13, 2012, at the Wayback Machine. ↑ Thomas Joseph. "Liturgical Calendar of the Syriac Orthodox Church". Sor.cua.edu. Retrieved 2013-08-13. ↑ "The Local Authorities (Referendums) (Petitions and Directions) (England) (Amendment) (No. 2) Regulations 2001". United Kingdom Office of Public Sector Information. Retrieved 2009-04-11. ↑ "Republic Act No. 9492". 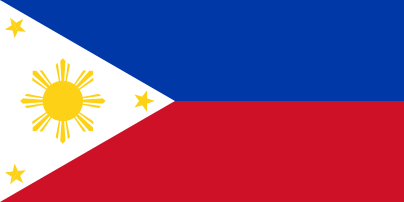 Philippine Government. Retrieved 2009-01-26. ↑ Charles Dickens. Maundy Thursday and Good Friday. Sine nomine. Retrieved 22 March 2012. Maundy Thursday is the day immediately preceding Good Friday. It was also known as Shere Thursday, probably from a custom of the priests, who on this day are said to have shaved themselves and trimmed their hair, which had been allowed to grow during the preceding six weeks. An old chronicle says "people would this day shere theyr hedes, and clypp theyr berdes, and so make them honest against Easter Day." ↑ "New Catholic Dictionary". Catholic-forum.com. Retrieved 2013-08-13. ↑ "The old English name for Maundy Thursday was 'Sheer Thursday', when the penitents obtained absolution, trimmed their hair and beards, and washed in preparation for Easter" (Hungarian Saints). ↑ Daniel Burke, CNN Religion Editor (21 January 2016). "Pope Francis changes foot-washing rite to include women - CNN.com". CNN. ↑ Why is the Thursday preceding Easter known both as Holy Thursday and Maundy Thursday? ↑ "Maundy Thursday". The Armenian Church. Retrieved 2013-08-13. ↑ "Churches of the Brethren". Brethren.org. 2013-08-08. Retrieved 2013-08-13. ↑ "What is Maundy Thursday?". United Methodist Church. Retrieved 2007-03-21. ↑ "Maundy Thursday". Catholic Culture. Retrieved 2007-03-21. ↑ Herbermann, Charles, ed. (1913). "Stripping of an Altar". Catholic Encyclopedia. New York: Robert Appleton Company. ↑ Pfatteicher, Philip H; Messerli, Carlos R (1979). Maundy Thursday: Stripping the Altar. Lutheran Church. ISBN 978-0-8066-1676-6. Retrieved 2007-03-21. ↑ The word is of medieval origin and may refer to the possible use of green vestments on this day in some regions, or to a custom of eating green salad or pancakes (cf. Deutsches Wörterbuch by Jacob and Wilhelm Grimm). The name could also derive from Old High German grīnan ("mourn" or "wail", cf. Engl. groan), referring to the death of Jesus or the penitents' return to the eucharist on this day in older times (K. Küppers, "Gründonnerstag", In Lexikon des Mittelalters, vol. IV,, DTV, Munich, 2003). ↑ "Planning your trip_www.visitdenmark.com". VisitDenmark. Retrieved 2013-08-13. ↑ Only Manila Cathedral and San Agustin Church remain in situ after the 1945 Bombing of Manila during Second World War. 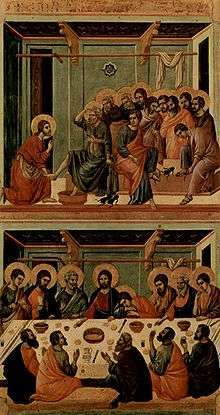 Look up Maundy Thursday in Wiktionary, the free dictionary. 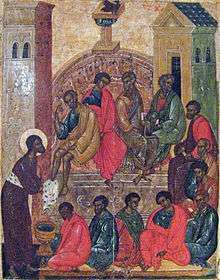 Wikimedia Commons has media related to Maundy Thursday.